1- Follow the direction “Le Port/St. Paul/St. Pierre” and take the 4-lane (Route des Tamarins). 2- Exit “Piton Saint-Leu” straight through 2 roundabouts. At first stop sign, turn left, then immediately take the first right (You go to reach the D11). 3- At the roundabout, turn right (You’re on the D11 towards les Avirons). Continue straight for about 3.5 Km (You cross Le Piton and Le Plateau). 4- After crossing the “Ravine Trou” (A few laces) Austral Passion is on the left, the entrance is just after the “Résidence les Baies Roses”. 1- Output Etang-Sale/Saffron Walden. Get in the forest following the direction “Les Avirons” (left at the 1st intersection). 2- At the stop (you arrive on the D11) turn left and cross the village of “les Avirons” to cross the ravine of the same name. 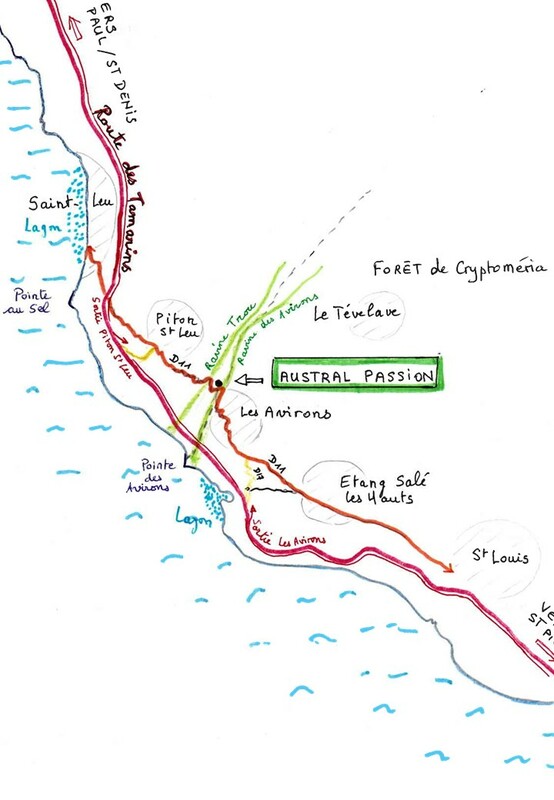 3- A 100 m after the bridge over the ravine, you will find Austral Passion on your right. Leaving through the south of Saint-Leu, turn left towards “Stella/Piton Saint-Leu”. Make 8 km staying on the D11 road. After passing “Le Plateau”, cross the bridge of the “Hole Ravine”. A few laces and the input Austral Passion is on the left just after the “Résidence les Baies Roses”.